You can’t always get what you want, as Mick Jagger so memorably whined in his Sixties heyday. But that doesn’t meant it isn’t worth trying. 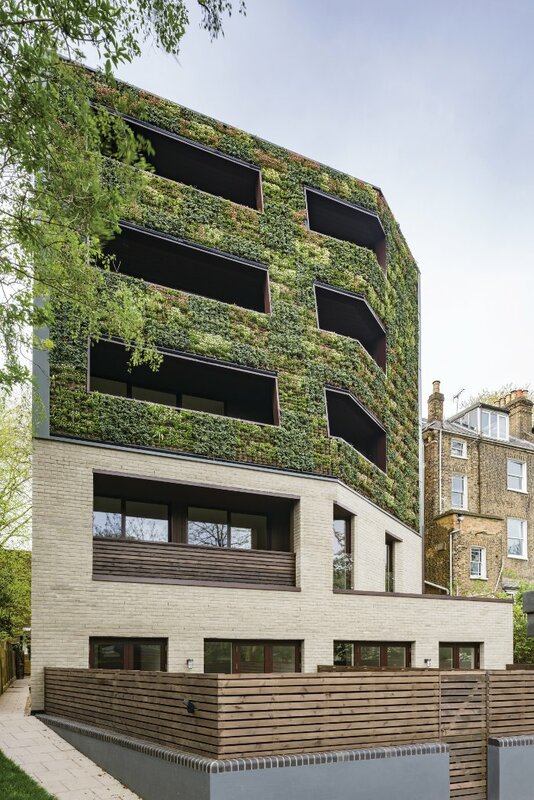 The spirit of this refrain (and response) underpins conversation with architect Steve Sinclair as he tours me around a recently completed residential project in Grosvenor Avenue, one of Islington’s more distinguished, leafy, Victorian-terraced streets. 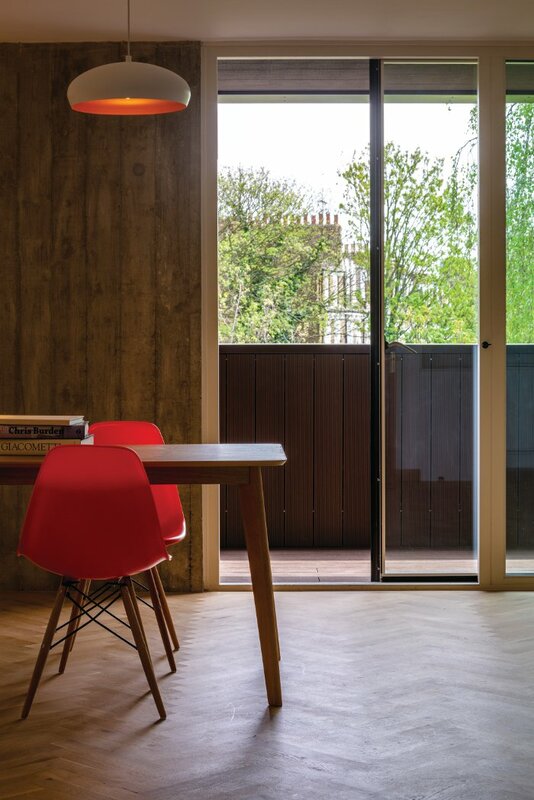 The building was conceived as a thoughtful reworking of the European mid-century townhouse typology, translated to this 19th-century Islington setting, and it delivers on many fronts. It oozes far more solidity and spaciousness than the classic mid-century townhouse. 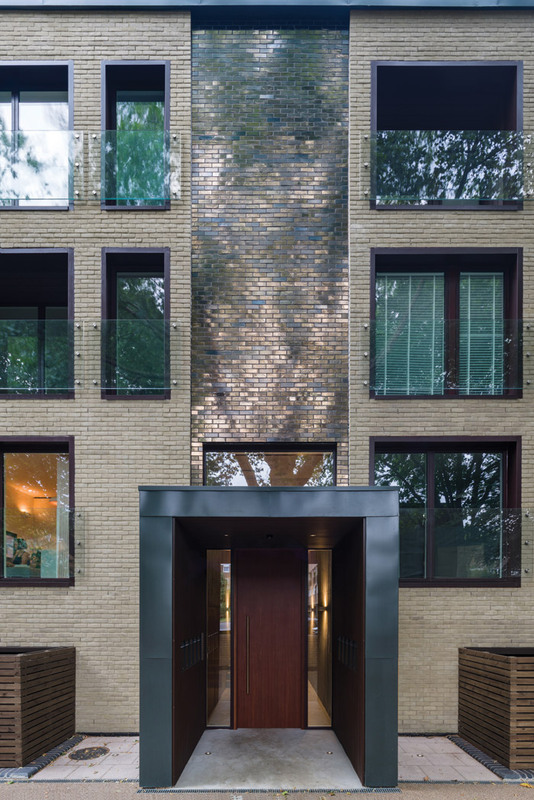 And the scale and simplicity of its windows at the front allow ample light into each apartment, while their panes — as well as a central panel of glazed brick — reflect the tones and dappled light from this leafy avenue’s many mature trees back into the street. But Sinclair still winces as he describes the budget-slashing conclusion to this project, where the handsome grey brick they had picked out for the exterior — to match that of the mortar on the Victorian brickwork — was ditched and this much cheaper, poorer substitute (pale-yellow stock brick) selected instead. Then a neighbour objected to the angle at which the back of the original scheme would project over his lower side windows. Eventually a compromise was reached: the left rear elevation is chamfered off at an angle, so the neighbour gets his daylight. And the tenants actually get a rather unique aspect to the left-hand flats’ exterior walls. During the delays, however, the developer got sidetracked — along with a big chunk of his financing — by a larger scheme; budgets were cut. A struggle with the council over affordable units ensued (the council lost). Details and finishes suffered. Nevertheless, it went on site in early 2017 and completed summer 2018. 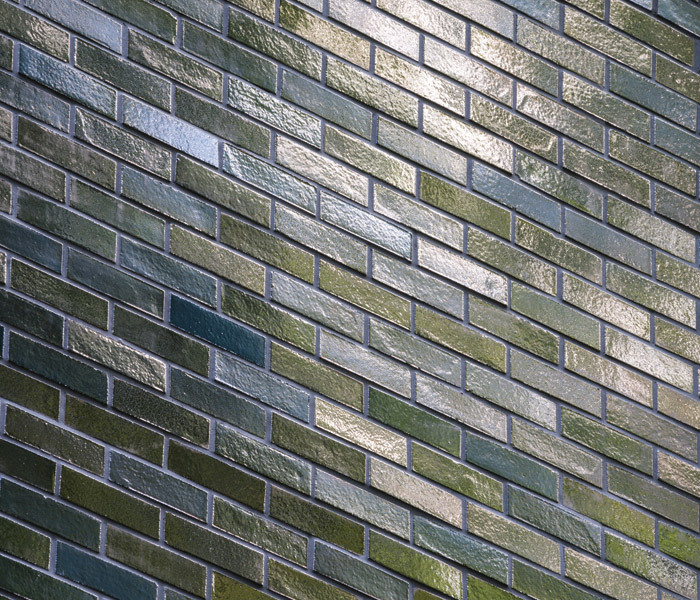 And if the project hasn’t quite succeeded in meeting all the architects’ ambitions, it has delivered far more than most schemes of that scale and budget (£3m). A massive metal entrance portal with overscaled wooden door leads to a spacious, double-height lobby with shuttered concrete walls travelling the whole length of the stairwell. ‘We really didn’t want to do a poky-style developer entrance,’ says Sinclair. And they succeeded here. A smooth ‘concrete’ resin staircase leads down to the lower ground and up to the first, second and third floors, framed by a raw steel balustrade. Designer concrete light fittings (Tomado and Gant) add a further touch of class. At this point, the building begins to feel rather Barbicanesque, and Sinclair reveals that their aspirations for the interior were indeed to evoke this Seventies icon by Chamberlin, Powell and Bon, or those of contemporaneous architects John Lautner and Denys Lasdun. There is a width and height, a generosity to the proportions of these flats and the care and craftsmanship over their finishes is reminiscent of the best of mid-century apartment housing (flats range from 70 to 80 sq m; all are two-bed). 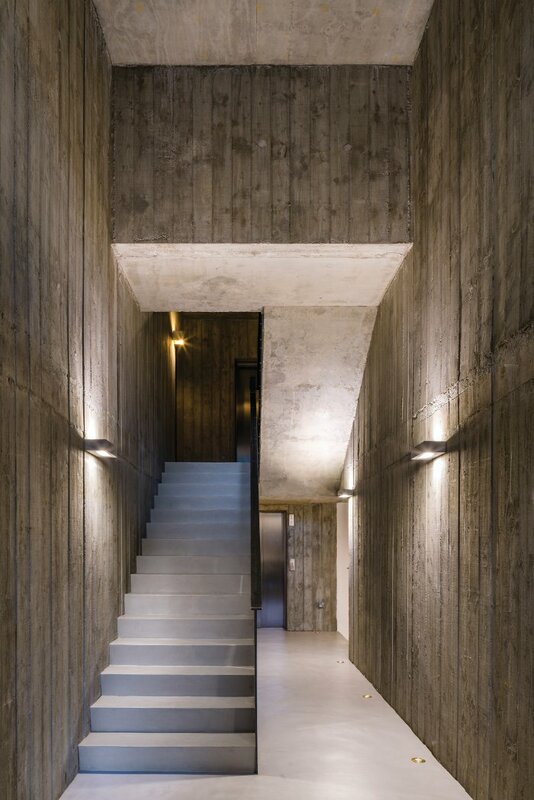 fourth_space wanted the interiors to be expressive of their concrete structure, softened with natural materials. Floors in living rooms and bedrooms are pale, solid oak parquet; there is bespoke Sapele timber joinery in the bedrooms; brushed brass fittings and fixtures in every bathroom and kitchen and on light switches and plugs. The kitchens were fitted by a local joiner, with counters made of pale marble. The en-suite bathroom off the master bedroom has herringbone, pale marble, floor tiles; though the smaller shower and floor space off the main corridor has been downgraded to simple stone tiles. 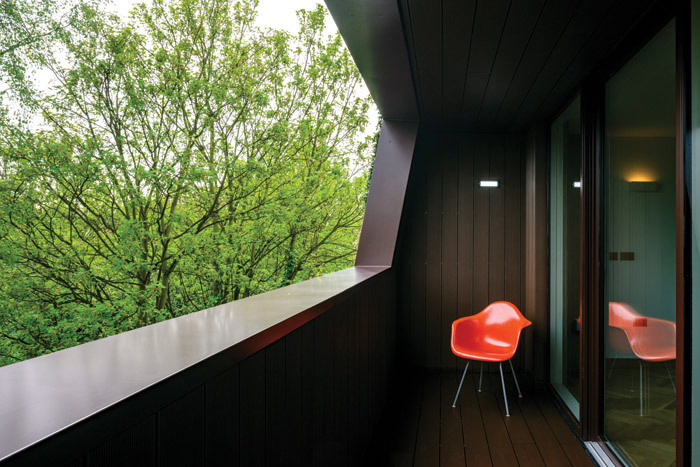 Balconies at front and rear are lined in dark composite decking. Those at the back on the top three floors are framed in foliage that spills down the rear of the building from the living wall, creating truly enticing nooks in which to drink coffee on a sun-drenched morning or watch the sunset at cocktail hour while relishing the luxurious amount of space at the rear. Overlooking the railway track of nearby Canonbury station, there isn’t another building for quite some distance. From front and rear, there is a lovely sense of being lifted up into the tree canopy. Despite all of this, looking at the project as a whole, Sinclair says: ‘We are really proud of this because we know the challenges that went with it.’ As well he should be.